You can cook bacon in the oven. Seriously. 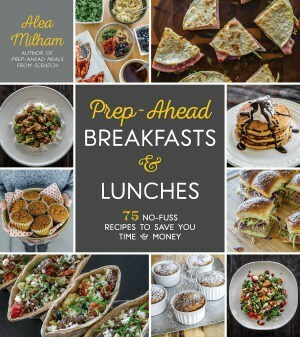 This tip for how to cook bacon in the oven is from my cookbook Prep-Ahead Meals From Scratch. You are going to love this method once you realize how easy it is to bake bacon instead of cooking it on the stove top. When I cook bacon, I like to batch cook several pounds of bacon at a time. To easily batch cook a couple pounds of bacon at one time, I cook it in the oven. Cooking bacon in the oven is so much easier than cooking it on the stove top. Besides being able to cook a large amount all at the same time, you don’t have to deal with the mess of the splattered grease everywhere. Don't preheat your oven. You will turn on the oven after you have placed your bacon in the cold oven. Use cold bacon straight from the refrigerator. If you let the bacon sit out too long, the pieces will stretch out when you place it on the cookie sheet. You need to use a baking sheet with raised edges. I like to use jelly roll baking sheets because they hold more than cookie baking sheets, but either will work. If you want to make clean up easy, place foil over your pan. Then you can throw away the foil and put the pan back in the oven once it cools. No washing! I use this 18-inch wide foil because it is wide enough to completely cover my baking sheets. If you wish to ease clean up, cover your baking sheets with foil. 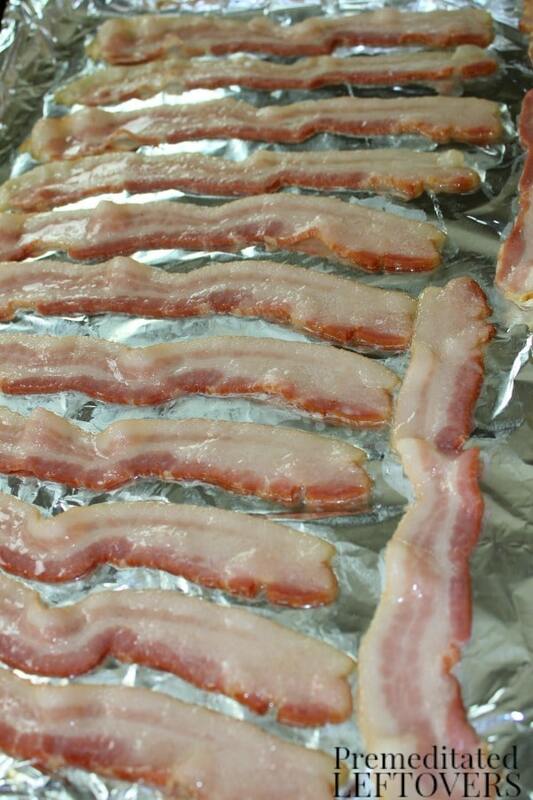 Separate the bacon strips and spread the pieces out on your baking sheet. 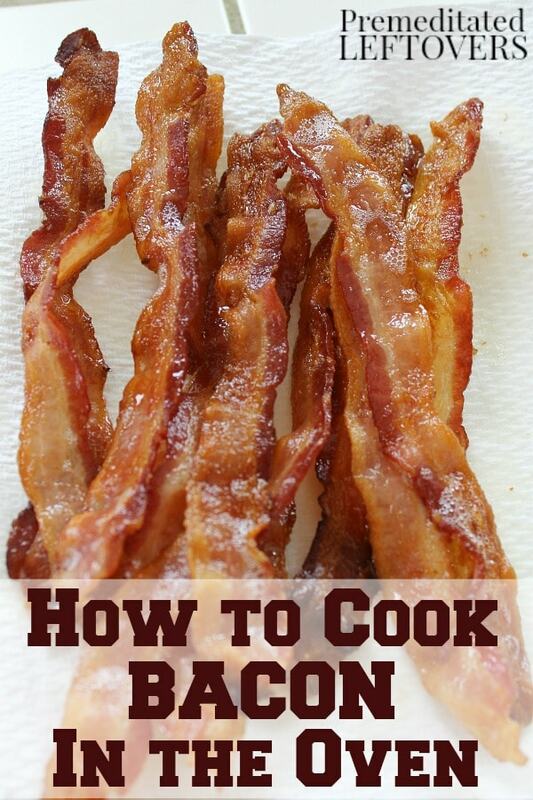 Repeat until you have spread all of your bacon out on baking sheets. I can usually fit 1 pound of baon on a jelly roll bacon sheet. Place the baking sheets in a cold oven and then turn the oven to 400 degrees. Bake for 15 – 20 minutes. After 14 – 15 minutes start checking the bacon to ensure you don’t burn it. 6. Line a plate with paper towels. 8. Use as called for in recipes. Crumble any extra bacon and freeze to use in recipes in the future. There will be some bacon grease on the baking sheet. 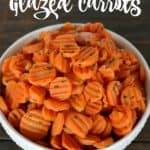 I save the bacon grease rather than throw it away because I can use it to cook vegetables in to give them a little bit of extra flavor rather than using oil. So I store the bacon grease in a sealed container and put it in the refrigerator so that I can use it later on when I’m making green beans or some other delicious dish. 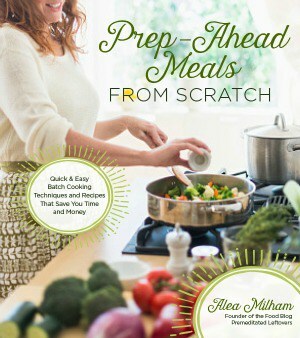 Photos by Chris Holloman for Prep-Ahead Meals from Scratch. You can see all of the steps for cooking bacon in the oven in the following video. For more Batch Cooking Videos, Subscribe to my YouTube Channel here! The next time you want to cook bacon, try cooking it in the oven instead of in the frying pan on the stove top. I think you’ll find it really convenient and it doesn’t take any longer and you can cook several pounds at once. Bake for 15 - 20 minutes. After 14 - 15 minutes start checking the bacon to ensure you don’t burn it. 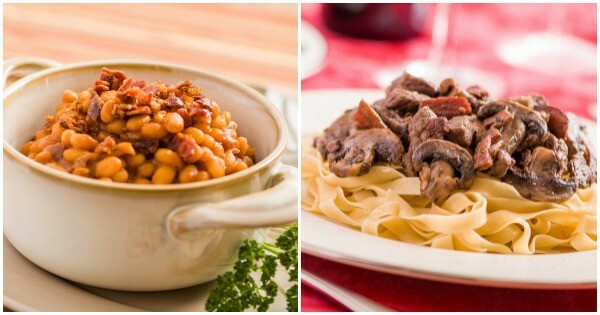 You can find more batch-cooking tips for beef, pork, chicken, rice, and beans, as well as lentils in my cookbook Prep-Ahead Meals From Scratch, and you’ll find over a hundred recipes using those batch-cooked ingredients in quick and easy recipes. So glad to see you baking your bacon! I’m a true convert of it! I usually do 2 pounds at once. I actuallyuse baking stones (just like a jelly roll pan but stone. Hello pampered chef!) I don’t line them with foil. sometime I even save that fat, it’s awesome on string beans! I found your website from my favorite blog “slob comes clean” I can’t wait to peek at your site! I’m a HUGE leftover lady! I usually make double batches of whatever meat I’m cooking and keep changing it up! 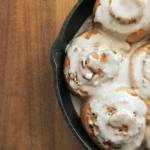 I switched to bakin’ bacon several years ago and love it! I use the aluminum foil but then I place a cooling rack right on top. (Fits perfectly on my cookie sheet.) The grease drips through onto the aluminum foil and the bacon comes out perfect! Does the grease from the bacon splatter in the oven ? How long will the bacon keep after it is cooked? 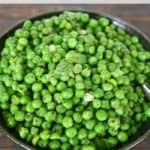 I keep it in the refrigerator for up to 5 days or in the freezer for up to 3 months. Can you place parchment paper over the bacon to reduce splattering? If you place the bacon in a cold oven, then turn it on, it will not splatter. If you are doing green beans in the frying pan, you are saying you substitute bacon grease instead of oil? Isn’t it too greasy? No. You just add 1 to 2 tablespoons and use it like oil. Tried it with turkey bacon and regular bacon. Delicious and will do this from now on!